Lanny McIlvrae is unlike anyone Luke has ever met. Hers is a story of love and betrayal that defies time and transcends mortality - and cannot end until Lanny's demons are finally put to rest. Her two hundred years on this earth have seen her seduced by both decadence and brutality - but through it all she has stayed true to the one true love of her life. Until now. 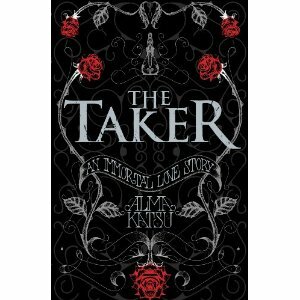 An unforgettable novel about the power of unrequited love to elevate and sustain, but also to blind and ultimately destroy, The Taker is an immortal love story on an epic scale..."
I absolutely adore the UK cover. Its definitely the first thing that drew me to it. I even did a blog post based just on the beauty of it. Imagine my happiness when I read the blurb and the story was right up my street too. I love the victoriana style of it, with the Gothic roses and silver coloured branches. The bi-line tells you just enough to get you intrigued and know what the story is about. Also the edges of the paper are black - SO COOL!!!! This alone gets a huge thumbs up from me! So from reading the blurb it was safe to guess this wasn't a typical young adult book like I would normally buy, but there was just something about it that I just had to read. It starts off about a guy called Luke & his life as a doctor in a small town in the US. I was surprised on reading it, that it was in a narrated style and I most definitely didn't expect that. Its not till the end of the first chapter you really learn that the story is more about the girl Lanny and so you are really reading from her perspective. It was quite a cool reading twist. You are thrown straight into a story of mystery, that is most definitely clever and engaging. You feel a part of the story from the get go. I just wanted to absorb every aspect of the it. The book is set in 4 parts. From the first part, I couldn't really see why it was an adult book. There are some scenes of sensuality and passion, but nothing really gratuitous. Then I got to the second part of the book and it took a very dark, sinister turn. I could completely understand the adult classification then. There really are some harrowing scenes that made me feel quite uncomfortable and I actually had to put the book down to process what I had just read. But still I was absolutely captivated and I needed to know what was going to happen next, how they were going to get themselves out of the situation they were in, why they had done whatever it is that had just happened? Its such an enthralling read. The revelation of what the Taker is, happens quite close to the end of the story. I must admit I did not guess the twist that Alma had in store, I actually kicked myself for not realising. But I always love a surprise and these days its quite rare to get a good shock from a book. Well done Alma!! The end of the story left me a little deflated, with some questions still to be answered. I have since found out that there will be a sequel - YESSSSS! I am so excited to see what happens next, I really do need these nagging answers!! This book had me up for hours a night, I just couldn't put it down. I couldn't be woken in the mornings, so it was guessed very quickly I had 'one' of them books that was amazing. The only reason I won't be giving this 5 out of 5 is because there were parts that I just couldn't relate too (thankfully) and so my connection to the characters wasn't as deep. However I shall be recommending this to everyone. 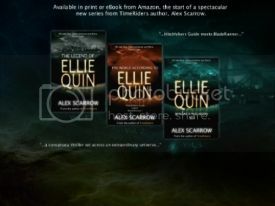 It is a great jumping book from YA to adult, just be prepared for shocks and turmoil. I see that you liked this book a lot. Have it on my TBR pile. Will get to it eventually. Come visit me. Next month on my blog is Young Adult Month on my blog. So come visit me over at Livre De Amour-Books of Love Blog. What a intricate story Alma Katsu has weaved. I was instantly drawn in to the mystery of the characters as well as the stories they told. Can't wait to find out what'll happen next! Loved it!